But a caring friend to me. My angel in both word and deed. We giggled and we cried. We were always side by side. We’re sisters, heart to heart. Picture 2005 Not so long ago, I told Shayla that I missed Christi so much and that I thought she'd like to be riding home from school with us on a beautiful day with blue skies. She surprised me with her repsonse. She said, "I miss her too. You know what I miss most?" I immediately assumed she'd give her typical response, "I miss always having someone to play with," but she taught me something new with her response. Picture 2004 She said, "I miss her calling me Stylin' Cute." I said, "What??" Shayla explained after I'd do Shayla's hair or put her in a pretty outfit Christi would say to her, "You're stylin'." Shayla said she'd say back, "You're cute." Then Christi would say, "You're Stylin' Cute," and they'd both laugh. One more treasure I was happy to learn from a little one who knew Christi in a totally different way than I did. 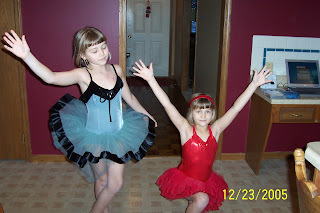 One more reason why I MUST get some video footage of Shayla talking about Christi soon, before she forgets special memories of her big sister. Ironically, recently while struggling with the email "situation" an unopened message just appeared so I clicked on it. It was sent on September 3rd 2006 and it's from Christi's sweet friend. I think it was unopened because it arrived in the midst of a very hectic time. (Actually, there are many emails yet unopened from those sad September days. This was during the period of Christi suffering with horrific pain and her brain radiation torture.) Regardless, I never opened the message and therefore never got these words to Christi. I also had to cry because it was just so sweet! Her friends learned too much and my heart continues to ache for them and their loss. The summer before Christi's death, these two would talk for hours on the phone. I'd just hear Christi giggling and giggling as they sang, told each other jokes and so on. I long to hear that laughter! Twenty days after this message arrived, Sarah read a tribute poem at Christi's funeral. I'm sorry that you feel so yucky. My Mom explained they are trying to help with the pain. I hope it helps soon. I miss being able to talk to you, so I wrote instead. Due to some life changes of the sweet party planners and to the fact that I am in the midst of finishing my final OSU courses and writing two chapters of my dissertation this quarter, I decided it best not to physically hold a "Christi's Tea Party" this year. Last year's still provide us with the sweetest memories of being surrounded by those who loved Christi on her birthday; it also allowed us to raise funds for her Memorial Fund - keeping her legacy alive. This year, however, it will need to be done "virtually". Our deepest thanks to the amazing Olivia who has offered to home make "Christi's Tea Packages". Listed below you'll find all of the information you need to "attend" if you're able. Please accept our deepest thanks and gratitude for helping with this fundraiser, if you're able!! In honor of what would have been Christi's 11th birthday, Tea Time Packages are being sold. These packages are a special way to celebrate and acknowledge Christi's remarkable life—a party in a box! The suggested donation price for each Christi's Tea Package is $15 (shipping is included). To place your order, please email: christi.birthday@gmail.com. Orders will be accepted through May 31, 2008. All funds raised will be donated to the Christi Thomas Memorial Fund and the Kids Cancer Crusade. These organizations were established in honor of Christi and her love of learning, of the arts and of helping those most in need. Together, we can all celebrate Christi's special day and keep her legacy alive. We know this horse leasing contract we've taken on is a HUGE responsibility so Shayne has committed to making all of Shayla's lessons and to being at the fair to take over, if needed, this summer. (Shayla's mom is really nervous around large animals and those instructors could obviously see right through her, despite her trying to smile and act confident! Hee! Oh, well!) I'm thrilled Shayne can be flexible with his schedule and that he's such an amazing dad to let her do all of this! We are so blessed. I've been working with her on the project books while Shayne has been teaching her how to tie the knots, etc. Thankfully Kelsey, without a horse for the first time in about ten years, has volunteered to help Shayla by working with her once a week. Shayla adores Kelsey and since she just happens to be her class's Valedictorian, graduating in May, we think she knows just what to teach Shayla. Praise God for Kelsey! (Kelsey walked the "riderless horse" for Christi's funeral, not too long after she had Christi come out and ride her horse - see picture. From my view, behind Christi's hearse, I thought it was beautiful, but I understand it was very hard for Kelsey who had tears flowing the entire journey from the funeral home to the church. Shayla needed to submit a photo of Skeeter by May 1st, in order to enter at the fair. Here he is! A beautiful Bay Gelding, 15 hands high. (How about that?! I'm learning a lot! It was really interesting to learn how a horse is measured, etc.!) And the instructor did scold me for wearing sandals to the barn, oops! Shayla receives directions from her wonderful teacher she's taken lessons with her for the past 14 months. Shayla has decided to enter in both Western and English areas at the fair so I will also be looking for both an English and a Western riding outfit. (I did rush out to Wal-Mart and purchace her the long black pants!) I guess the "swap meets" are over for the year, but Ebay should be a good option for us. 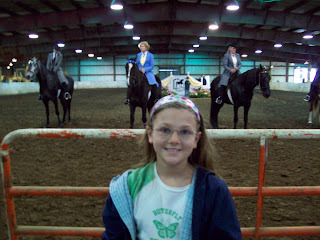 Shayla attended her first 4H club for her Riding Club recently and came on "in the office". (Smile.) After they elected Officers, they assigned committees for those who were interested. (It's a big club - about 25 girls ages 8-18.) Of course Shayla's hand shot up when they asked who was interested. We really don't know if she's on the party planning committee (right up her alley!) or the safety presentations committee, as we were sitting in the back, but they let her go up and sit at the front table with her mentor and she just beamed. Getting back in the van, she said to us, "I just can't believe I am in the office!" We held back our laughter, not wanting to tell she's really just serving on a committee. I think Shayne had a nice birthday yesterday, even though it was a long, exhausting day. After his challenging bike ride, we took off for Columbus where we throughougly enjoyed watching the "Mid-Ohio Walking Horse Show" in Hillard with Marty and Jeff. Then it was on to watch two of Ashley's Varsity Lacrosse games - in the cold, rain at two different Columbus High Schools. We LOVED it!! (And it went against everything my mother taught me "Play nice and don't run with sticks!") She's an amazing sport and it was so awesome to watch her and her teammates!! I learned she put "Christi Can" on her Lacrosse stick and I was very touched. It's hard to believe she'll be off to college next year, also graduating at the very top of her class - a class of over 700; she's simply amazing! We were able to share Shayne's cake with everyone where it produced some great laughs. It actually tasted very good, despite it's "curb appeal". We gave our little nephew an iPod shuffle for his birthday and the look on his face was priceless! His mom told him he could have one when he turned 17 so he was very reserved, and VERY happy! 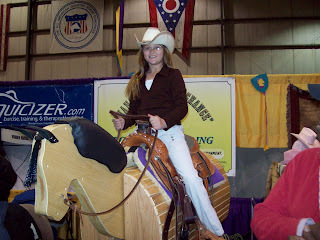 Late this afternoon, I will take Shayla to her 4-H meeting. While being in two 4-H clubs was probably not the best way to get started with 4-H, I continue to be very impressed with the advisors and parents and I just sit in the back for the meetings, which last a couple of hours, and I get a lot of reading done for my classes. Take care, be well and have a great week! Christi and Tiffany on the campus of Heidelberg (September 2005). Tiffany's mom sent me an email Tiffany had sent to her. Tif wrote: I am getting more and more nervous. We were just talking about it and I was sobbing...I just feel so bad accepting this award. I would pay them $1,000 to spend just an hour with their little sweetie. 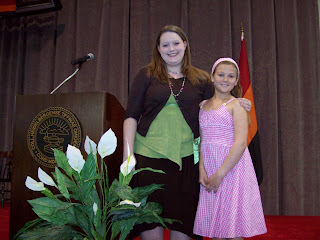 Shayla & Tiffany at Heidelberg's Student Award Celebration yesterday. I only teared up as Shayla and I held hands and walked to the gymnasium for the scholarship announcement. She said matter of factly, "It would have been nice to give Christi the money to go to college, but since we can't it's nice to give it to other kids, especially Tiffany, she's my babysitter." I said, "You are wise beyond your years little one. I cannot believe you processed all that." She stopped walking and kissed me with that beautiful little face. The awards celebration was lovely and I did not shed a single tear.....until afterward. We had invited Tiffany and her fiance to go out to dinner following the event. While we were waiting for them to finish talking with their parents, Tiffany came over to me and said, "We want to ask Shayla to be a junior bridesmaid in our wedding, but we want to make sure that's ok with you first." Well, that did it. I choked back something like, "Of course! She will love that." I knew Tiffany, with her love of children would have lots of little ones in her wedding next summer, but I never thought Shayla would be one of them - wow!! When we arrived home last night after dinner at the Pioneer Mill, I said to Shayla, "I simply could not believe they asked you to be in their wedding!! What did you think?" She squeezed her lips together, clasped her hands in front of her, shrugged up her shoulders and froze. I laughed and she hugged me and confessed, "Oh, Mommy!! I am so happy! That will be so much fun!!" Thank you sincerely for your extremely generous donation of $20,000 to our research program. We pledge to continue dedication to eradicating the pain and suffering from neuroblastoma in honor of Christi and other children with cancer. I recently came across this picture and it brought back memories of the many times I watched Christi snuggle with "Buttercup" in this precious manner! Christi would be very pleased to know that Shayla takes incredibly good care of her cat. Christi, I miss you terribly; yet I tell myself you are only a cloud away and when things like today's letter come I remind myself that you did make a positive difference in this world! Tonight, after Shayla's horse riding lessons, was a big beautiful cross in between some lovely clouds. It reminded me of Christi's afternoon of First Holy Communion when she saw a similar cross appear over our house and she said something like, "I wonder if that's Grandpa Vince!" Tonight I told myself that it was Christi letting me know she was happy about that amazing $20,000 donation too! Still trying to kick cancer's behind, from a much better place! It’s been a while since my last update. I guess I learned that my sweet mother counts on this blog for our whereabouts so perhaps that’s why she had to call to check up on me! (hee hee) Shayla was thrilled that one of her grandma’s returned to the Buckeye state (and just in time for the School’s Grandparent Night program) and it appears (Praise the Lord!) my mom will soon be making the trip home too! I’m anxious to head over and visit since I’ve not been able to do that since fall. While Shayla was at her religion class, I went to the library to pass the time not too long ago. I ran into the mom of one of Christi’s friends there; it was great to catch up! I am absolutely sickened to learn of the radiation and oral chemo treatments her husband will be undergoing. I can only remember the torturous hell we put Christi through in those last ditch attempts and truly wish we would not have. She was so frightened. While this is a totally different situation, it just made my stomach churn. She also shared that Kaylyn and Theresa presented the “Friendship Never Ends” poem Christi wrote shortly before her death that I discovered not too long ago. Even though I cried, I did so because I thought it was the absolute sweetest thing ever. There really could not have been anything that made me so happy that day! For those two girls to stand up and read that in front of their sixth grade class as part of their poetry unit makes me realize that they remember Christi and how much they cared about her too. Beautiful! Ironically, that very same day as I ran into her at the library I watched Kay and Theresa walk down the hall together after lunch and my heart just ached knowing Christi would have loved to have been there with them too! Some days it’s oh so hard! Not so long ago I had to have some blood work done at the hospital. I NEVER thought anything of it – UNTIL I walked into the hospital and then it hit me. How many times had I made this trip with Christi. As I sat there and waited in the waiting room, vivid memories of passing the time there with the little sweetie came flushing over me. Countless times we’d start our day there, run to school, and if she needed a transfusion head back after school – ugh! How did I live that life? Soon it was my turn and what do you know but Christi’s favorite phlebotomist was working. Yikes! That did me in. I bit my lip to keep from crying, sat in (Christi’s) chair and held out my arm. Christi got herself worked up over EVERY blood draw. She had a system down (and it took FOREVER) to draw her blood, as a result of her “system”. I just held out my arm and it was quickly done. Why did she let herself get so worked up EVERY time? It was no big deal?! Then, the tears just absolutely started gushing. The sweet lady told me that she thinks of Christi quite often and that she will never be forgotten. She gave me a hug and I cried all the way home. It was yet another “first” even though it’s really been so long. Someone in our home will be turning 40 in the next few days (smile). It’s nice knowing I won’t be the only one!!!! Shayne won’t be bragging about marrying an older woman too much longer! Shayla’s grade card was again fabulous! We want to do something special to celebrate all of those As she earned, but we haven’t thought of what to do yet. I’ve recently received some WONDERFUL news regarding my Ph.D. but that may be an entire entry of its own one day. (If I survive the rest of the quarter that is, hee hee). Meanwhile, I’m continuing to work hard!! It appears the Nexium continues to help me. The only attack I had was the one day when I forgot to take my medicine. I really hate being on it, but the attacks are so wicked I think it’s best. Sometimes my stomach starts acting up in the late afternoon / early evening so I take a second pill, that really helps but I know I need to let my doctor know what I’ve been doing about once a week. Maybe a stronger dosage would be better. Hmmmmm. 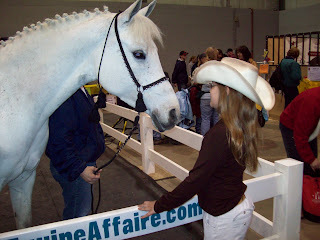 We attended the Equine Affaire (a huge horse show) in Columbus over the weekend with Marty and Jeff. Shayla was in all her glory; it was really amazing! 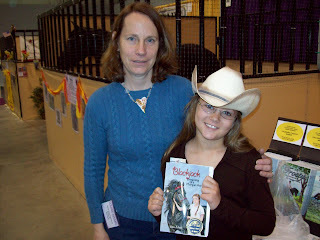 She had another 4H meeting (for her horse riding club) and is so excited about leasing “Skeeter”. I was SHOCKED at the prices on Western outfits at the Equine Affaire so if anyone knows of a good place to get, preferably a used outfit, please let me know. She’s only going to wear it for a few hours to show at the fair. Shayla had been asking when we’d get a babysitter for her. Finally, we went out so she could delight in playing with Megan. She had a ball! If you haven’t seen the movie “21”; we both thought it was fabulous. I’ll upload information regarding “Christi’s Modified Tea Party” VERY SOON! Thanks for checking and for everything; you’ve richly blessed us!!! Take care, be well and may God bless you and keep you safe!! Shayla especially liked being with the horses after most of the sessions. She learned a lot, we all did! http://www.portraitartonline.com/charcoal_portrait_of_Christi_Shayne_Thomas_by_portrait_artist.html (One can cut and paste this into their browser, or click on the red title "Portrait Art of Christi & Shayla" to access the link.) I think it's amazing to see the real photograph side by side with her artwork. What talent! Previously I had shared the finished artwork; recently I learned about this artist's website and that she added a bit about Christi to it. Again, I have no idea how much this cost as it was a gift from our sweet Texas friends, the Bakers, but if you need a special gift for someone I can assure you, we absolutely treasure ours. Just last week I picked up the framed and mats drawings. Today, Shayne will hang the drawings of our treasured gifts up in our bedroom. Although I wish there was no reason to give out scholarships, it is with great pleasure to announce the winner of the $1,000 Christi Thomas Memorial Heidelberg College Scholarship - Tiffany! Tiffany is a stellar student and came to the selection committee highly recommended and with a glowing application. 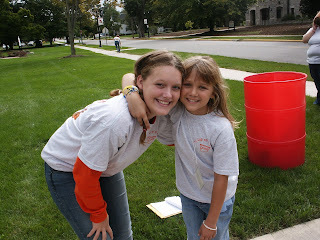 Although in her essay she never mentioned her hard work at ALL of the Lemonade Stands held on campus with/for Christi, nor the fact that she donated her long beautiful hair in Christi's honor, or was one of Christi's favorite babysitters, her many other merits stood out and captured the judges' highest scores. One of the judges wrote, "This one is a no-brainer!" Because we felt that two of the other applicants were also so very deserving, and so much like Christi and her amazing little spirit, we added some additional scholarship money. Ashley and Sarah will be receiving a $250.00 scholarship which we hope will help with their student teaching fees and books for their Senior year. Congratulations and best wishes to all! Shayla and I will be at the Student Awards Ceremony on Campus in a couple of weeks to watch Tiffany receive her award; Shayne said last year was a killer and he just didn't think he could bring himself to go again. It made me think of a couple who, in memory of their son's birthday, went to the community swimming pool and bought treats at the concession stand for every child at the pool and then cried and felt miserable as all of the kids enjoyed their treats and there son wasn't there celebrating what should have been his birthday. We want to do good things, but it really is hard to witness knowing the meaning and the reason behind it all. We just miss her so much! 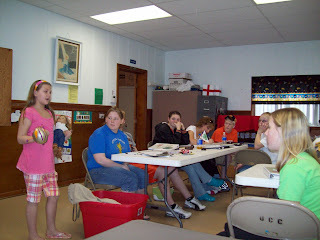 A few weeks ago, at the last 4-H meeting, Shayla was assigned to do a safety demonstration at the club's next meeting. She IMMEDIATELY knew what she wanted to do and soon started gathering her supplies to do her five minute talk on Horse Safety. Now this little gal had A LOT more than five minutes of information she wanted to tell about, but somehow she managed to get it done. We had listened to her presentation AT LEAST twenty times, so it was great to see her finally present and to really enjoy doing so. I hope the video clip works for you! 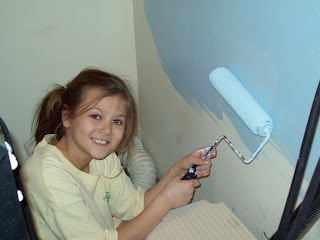 Thanks for helping with the painting of the bathroom, Shayla! You are a sweetie! The new flooring and sink should be here soon!! Shayla enjoyed rolling on the blue paint in the laundry room. As my sweet neighbor, who helped me select the paint colors for the two rooms said, "It's the color of Christi's eyes," after picking out the laundry room color. 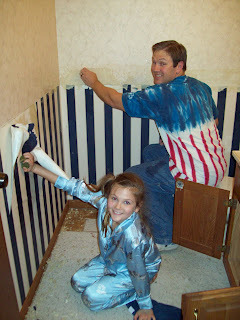 Shayla and Shayne strip the bathroom wallpaper in preparation for new paint and a new look! YES!! Shayla's "dad" in "Oklahoma" is a marketing student and selling yearbook ads. We decided to purchase a full page ad for this year's edition of "Tiger Paws". I selected a few of my "Christi favorites" and Shayne created this. Most will just flip through the yearbook and think nothing of it; we will chuckle. Notice there is no indigo in the rainbow at the bottom. Christi was on what turned out to be her death bed at CHOP insisting that indigo was a "shade" not a "color"; therefore, Shayne left purple off of this ad as a little inside joke for Christi's fans. I think, the funny little one would love this! “The Christi Thomas $1,000 Memorial Scholarship” will be awarded each year to a Senior at Dance Unlimited on Senior Night at the June recital. All of the forms and more information is available on www.ChristiThomas.org. Please note that all materials must be submitted electronically to: Scholarship @ChristiThomas.org. 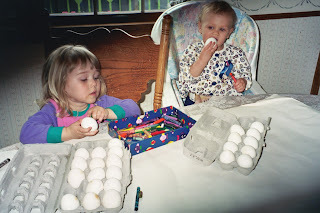 The due date is what would have been Christi’s 11th birthday – May 12th. Christi loved and treasured her Dance Unlimited teachers, directors, friends and classes. We believe she would want to help other dancers continue their love of learning at the college level. This $1,000 Memorial Scholarship is for a Graduating Senior, a Graduate or the son/daughter of a Fremont St. Joe Graduate. Applications for the scholarship are available at www.ChristiThomas.org (then click on “Scholarships”). Applicants are required to complete a form, submit an essay and have two letters of recommendation submitted on their behalf. 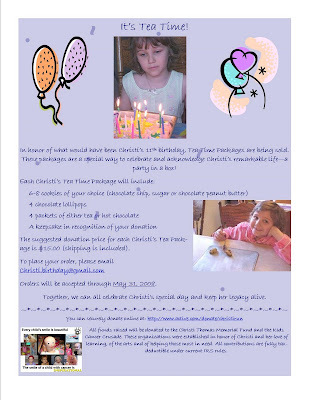 All items must be submitted electronically to Scholarship@ChristiThomas.org by the due date, which would have been Christi’s eleventh birthday (May 12, 2008). Announcing the $1,000 Christi Thomas Memorial Scholarship to be awarded each year to a graduating Senior from Seneca East. In September of 2006, nine year old Christi Thomas exhaled her final breath and left this earthly world. Hours later, Christi’s family established the “Christi Thomas Memorial Fund” in a concerted effort to memorialize their precious daughter’s short life. Thanks to generous donors, thousands of dollars have been raised and many programs designed to help others have been put in place. The Seneca East Fifth Grader repeatedly demonstrated a thirst for knowledge and a love for learning. In her memory, the Christi Thomas Scholarships were established to facilitate her desire to help others and to leave a lasting legacy. Each year one of these scholarships will go to a graduating Senior from Seneca East. Although disease and the required travel for cancer treatments would ravage her body and take her away from home, school, friends, pets and toys, it could never take away her rich experiences, captivating books, yearning to discover more and desire to do good deeds. Despite four years of treatments, Christi was in school whenever her health permitted and was happy to be there. Remarkably, to the amazement of those around her, she never ceased to find comfort and joy in learning and reading. Applications for the $1,000 Christi Thomas Memorial Scholarship are available at www.ChristiThomas.org (then click on “Scholarships”). Applicants are required to complete a form, submit an essay and have two letters of recommendation submitted on their behalf. 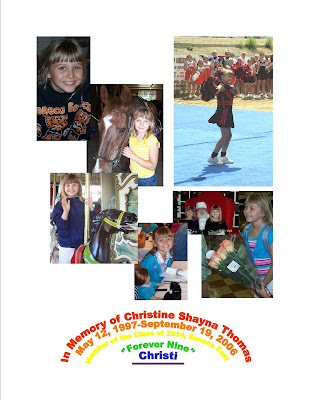 All items must be submitted electronically to Scholarship@ChristiThomas.org by the due date, which would have been Christi’s eleventh birthday (May 12, 2007). The Christi Thomas Memorial Fund is an official 501 (c) (3) Non profit foundation and part of the Gillmor Trust. All donations are tax-deductible to the full extent of the law.